I encourage you to take advantage of the myriad of resources there. 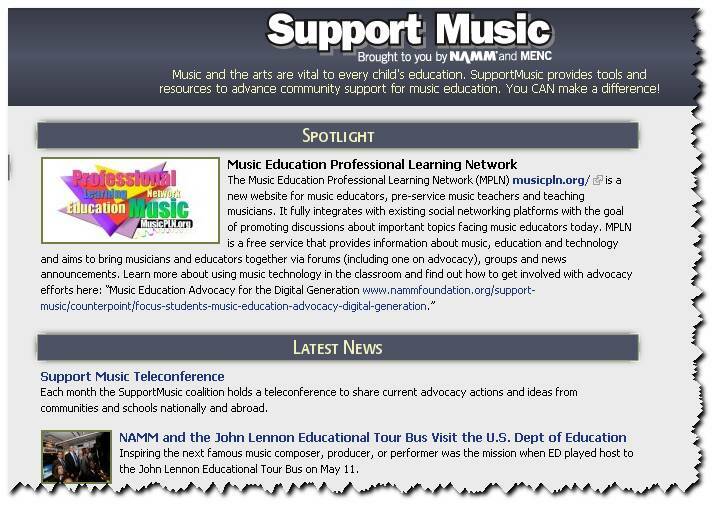 They are doing a wonderful job for the advancement of Music Education both here in the U.S. and across the globe! Also I recently performed a joint Webinar with Dr. Frankel. The transcript/audio/webinar itself can be found directly here: http://soundtree.com/webinar. The sky is the limit… and the money dictates how the Sky is (more sponsor opportunities)! 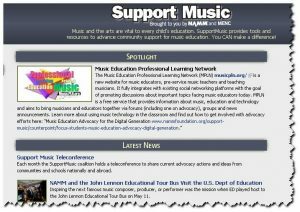 The MusicPLN.org will REMAIN a free-to-use site for Music Educators -we don’t need any more things to pay for! I’ve been talking about setting up a steering committee for a while now on the MPLN. As it stands, I’ve asked a number of people to serve on the committee and all that I have asked have agreed. The steering committee will help all of us to have better experiences on the MPLN. This will become increasingly important as the membership numbers increase. Expect the formal announcement of these great educators this month. Short-term goal: 2,000 members and 10,000 conversations by January of 2011. Please HELP us make this goal! WE must build the community and be active in the community for the community to thrive! The first of its kind – a FREE online music conference! This will be held on Monday, October 11th. METOS is your unique opportunity to gain valuable knowledge and insight from a panel of expert presenters located across the country, all in a single interactive afternoon. SoundTree has teamed up with a select group of technology partners to produce this concentrated and effective online event. The METOS conference will be divided into 16 separate sessions. While each will focus on a specific topic, together they will all address ways to effectively integrate the latest technologies into the music classroom. Don’t miss your chance to be a part of this history-making event. Admission is FREE for all music educators, but enrollment is limited. Conference details, online registration, and additional information are all available at www.metosonline.com. These are environments that allow students do/set their own learning goals or set up environments to help them learn a particular curriculum. Indeed, it is something that can include both formal and informal learning processes. The environment will allow them to manage their own learning or help them with learning of both content and process. The environment should also allow them to communicate and share with others. By harnessing and utilizing the power of the OPML file people are able to easily integrate dozens (or hundreds) of RSS Feeds into a RSS Reader without having to find and add the individual RSS feeds of each site that they would like to track. #MusEdChat – The Hashtag for a large group of Music Educators talking about Music Education and the funnel for the #MusEdChat every Monday Night at 8 PM EDT.